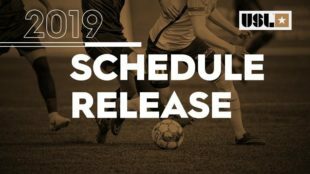 The United Soccer League Championship, formerly known as USL Division 2 (hereinafter abbreviated as USL-C), has released the 2019 regular season schedule for all 36 teams in the league. Exact start times are not published. USL-C will divide into two conferences and teams play each conference opponent home and away totaling 34 regular season games, the same as MLS. They will begin play the same weekend as MLS, March 8-10, and will conclude two weeks after MLS on October 18-20, the weekend MLS playoffs start. USL-C has also announced an expansion of its playoff format. The first ten places in each conference will make the playoffs. A “play-in” round will precede the quarterfinals, in which seven plays ten and eight plays nine. Play-ins occur Wednesday, October 23. The following weekend the lowest surviving seed travels to the first place team with the other survivor visiting second place. As in the past three will host six and four will host five. The playoffs remain single elimination played at the higher seed’s home field. Twenty-six of Bethlehem’s 34 games are currently scheduled for Saturdays, and the league’s release emphasized Saturday nights, telling Steel fans why the league drove the team out of Lehigh University’s Goodman Stadium. More importantly, 14 of Bethlehem’s 17 home games at Talen Energy Stadium are scheduled for Saturday. That matters because Major League Soccer has not yet released the Union’s schedule so several of those Bethlehem dates will have to adjust. The Union will claim Talen for Saturday night and the Steel will move, although playing a double-header early in the season might be a promotion worth evaluating. Eleven of Bethlehem’s first 17 are at home, among them the Steel’s home matches against five of the six remaining teams from the 2018 eastern conference playoffs. Correspondingly, Bethlehem are home only six times after June 30. In the marquee rivalry they visit New York Red Bulls II Saturday, June 1 and host them Wednesday, July 10. They open the season on Saturday, March 9 away in Birmingham, AL for Birmingham Legion FC’s first ever match. The following week, on Saturday, March 16 as currently scheduled, they host North Carolina FC at Talen Energy Stadium. Stay tuned because the details of several home games will change. Most readers will not remember that last off-season, with USL absorbing last-minute refugees from the dying North American Soccer League, USL teams had no schedule until the last minute and were selling vouchers not tickets into February. Only Bethlehem, having been forced at the last minute by the league to share a field with its first team, faces similar sales uncertainty this year. Any word on a home game or two played in the Lehigh Valley? I’ve heard the Steel/Union were working with the USL on that. Union/Steel PR folks have said they hope for two in the Lehigh Valley in 2019 on more than one occasion. i would definitely watch a doubleheader on Saturdays. Probably the best case scenario for the Steel move. – maybe someone really thinks outside the box and opens a warehouse city futsal building a couple blocks away and kids can get a run in between games, maybe that person could bring in Footbonaut, charge a nice rate around the clock for high tech passing improvement, imagine if that person really thought outside the box and turned that futsal warehouse into a MicroBrew too- with taco trucks and sub trucks outside- all manner of specialty food trucks…. imagine if that person thinking outside the box brought live music or DJ or house type music to the warehouse for late night…. Imagine calling it The Where’house. Gosh I love the concept. I fear that day is far, far off. The investment risk, I’d have to think, is too high given the fact that the area is a ghost town when it isn’t game day. Operating on game days only wouldn’t be enough to sustain any of those things, and none of those things on their own would be sufficient to make the area a destination in and of itself without a game going on. Anyone bold enough to be the first mover would likely die a quick bankruptcy death. Just another reminder that the Union’s location was poorly chosen.